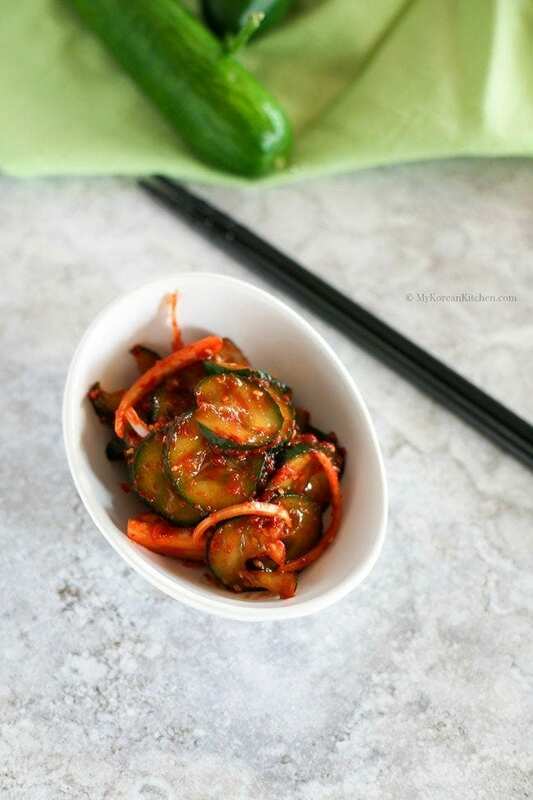 spicy Korean cucumber salad (Oi Muchim) recipe. It’s a perfect side dish for spring and summer weather. It gives you a little zing in your tastebuds! 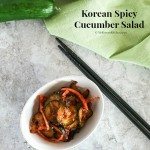 Korean cucumber salad (Oi Muchim, 오이무침) is my spring & summer time favourite dish. The smell of cucumber is always light and refreshing and its spicy, slightly sweet and tangy flavour gives you a little zing in your tastebuds, so it helps return your lost appetite, particularly in hot summer weather. Intrigued? As the cucumber naturally contains a lot of moisture, it is recommended that you only make this just before you serve your meal (no earlier than 15 mins) otherwise it doesn’t taste as nice (it can get a bit too mushy). – This is how I learnt during my home economics class. However, my favourite way of eating this salad goes slightly beyond this time limit. 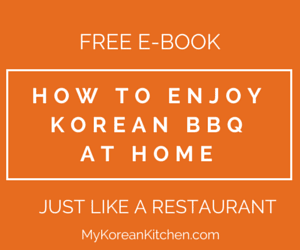 I will share my secret way of enjoying it in the recipe section, so be sure to check it out. 1 Cucumber (145g, 5.1 ounces): I used Lebanese cucumber. Korean cucumber or other cucumbers that are suitable for pickling or salad can be used. 1. Rinse the cucumber thoroughly in cold running water. Discard both ends of the cucumber. 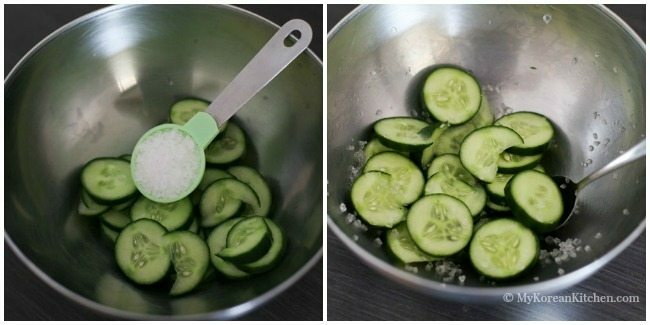 Thinly (about 0.5 cm (0.2 inches) thickness) slice the cucumber and put them into a large mixing bowl. Add the salt and lightly mix them together. Leave it for 15 mins. 2. While waiting, thinly slice the onion. Prepare the seasoning sauce by mixing them all together. 3. 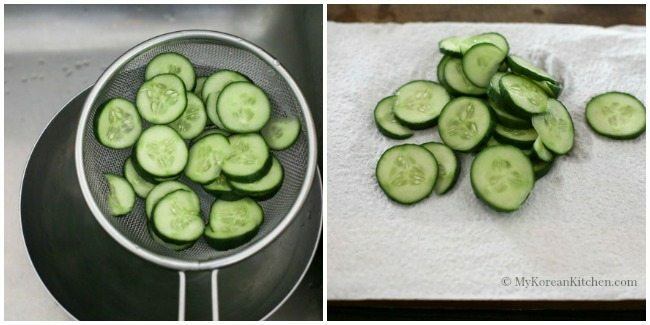 15 mins later, rinse the cucumber in cold running water (any remaining salt in the mixing bowl should be discarded) and drain the water out using a strainer. Pat dry the cucumber thoroughly with kitchen paper. Put them into a clean and dry mixing bowl. 4. Add the sliced onion and the seasoning sauce. Mix them lightly but thoroughly with your hand (You will want to wear a food prep glove). 5. Put the seasoned cucumber into a sealed glass container and keep it in the fridge for 30 mins to chill then serve. Enjoy! It can be served at a room temperature, but I think it tastes better when it’s slightly chilled. It should be consumed on the day you make this. Otherwise, there will be too much water in the salad. This salad is spicier than average Kimchi, in my opinion. Particularly, you will taste the spice kick in just after making it. However, while it’s chilling in the fridge for 30 mins, the cucumber will start to release the water and it will dilute the spiciness slightly. Personally, I really like this state of the cucumber. It’s chilled just right, still crunchy and also seasoned just right. But of course, if you can’t handle this level of spiciness, you might want to reduce the chilli powder and season it with fine sea salt. 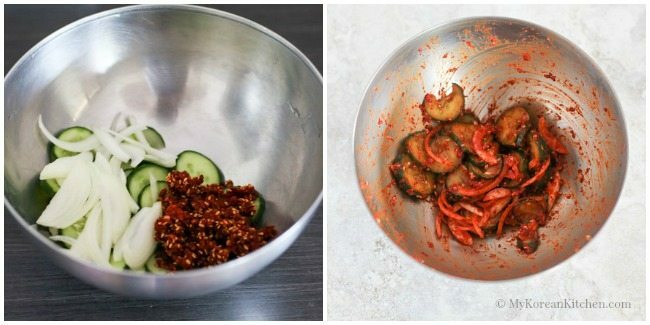 How to make spicy Korean cucumber salad (Oi Muchim). A perfect side dish for spring and summer weather. 1 cucumber (145 g / 5.1 ounces) - I used Lebanese cucumber. Korean cucumber or other cucumbers that are suitable for pickling or salad can be used. Rinse the cucumber thoroughly in cold running water. Discard both ends of the cucumber. Thinly (about 0.5 cm (0.2 inches) thickness) slice the cucumber and put them into a large mixing bowl. Add the salt and lightly mix them together. Leave it for 15 mins. While waiting, thinly slice the onion. Prepare the seasoning sauce by mixing them all together. Fifteen mins later, rinse the cucumber in cold running water (any remaining salt in the mixing bowl should be discarded) and drain the water out using a strainer. Pat dry the cucumber thoroughly with kitchen paper. Put them into a clean and dry mixing bowl. Add the sliced onion and the seasoning sauce. Mix them lightly but thoroughly with your hand (You will want to wear a food prep glove). Put the seasoned cucumber into a sealed glass container and keep it in the fridge for 30 mins to chill then serve. Enjoy! 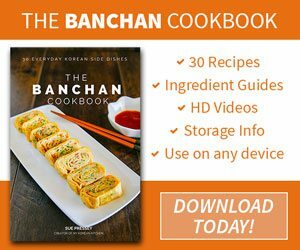 I started cooking for my Korean wife when she was diagnosed with cancer in November 2015. She is currently recovering and I still cook for her. It took me a year and a half to realized that all I was cooking was American food. Since that time, I have been buying instant foods from the Korean Grocery Stores and prepared from their deli. Recently, I have been looking for recipes and yours have been a true blessing. Today, I made the OI Muchim and not only was my wife surprised saying it was good but she ate half of it to proving it. I am sorry I didn’t take a picture, but I will in the future. Hi Rick, Great to hear your wife enjoyed your oi muchim! You’re such a caring husband! thanks for the recipe, I wonder if I could change cucumber with jicama? what do you think? Jicama is more like a radish than a potato. It’s like a mild, somewhat fibrous daikon radish. Just wondering, can I use the Gochujang as seasoning sauce for the cucumbers? And can I use it pure or should I dilute it with something else? 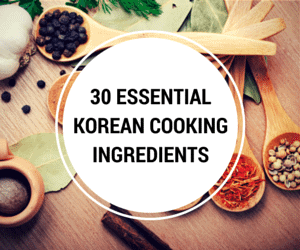 Hi Sharm, It’s not common to use gochujang for this recipe. You’re welcome to try it but I don’t know how it will turn out. I’m definitely going to try this for my next family party. One suggestion that came to mind when you mentioned the “too much water” part…. I have a cucumber salad recipe that I make multiple times every summer that I got from my grandfather and, while the ingredients are a little different, the prep is much the same. Having said that, his salad keeps for 2 weeks without the water issue. The reason for that is that, as with your recipe, salt extracts some of the water but, in the case of his recipe, as one slices the cuc’s, they are put in single slice layers with salt on top of each layer in a Pyrex dish. Once all of them are sliced, they are weighted down (I usually use a slightly smaller Pyrex and put jugs of water in it to provide substantial weight). After a half an hour or so, I drain the water and then squeeze handfuls of the cucumbers to extract as much water as possible. After doing that, I rinse them to get rid of the extra salt. Surprisingly, it keeps the crunch factor that you want as long as you don’t go too thin on the original slicing. I usually use a thick-ish slice on a mandolin and the cucumbers, at that point, absorb more of the marinade and the flavor develops overnight. I’m not sure that it will work for your recipe but I’m certainly going to try it. The ingredients and methodology is similar enough that I would bet that it would work nicely to allow for a little more shelf time for the end result. Apologies for the long response. Thank you for the recipe. I will absolutely be trying it within the week. Hi Thomas, Thanks for sharing your methodology! Let me know how you go with it. I’d love to find out the outcome. I once made this salad using 7 cucumbers and that lasted for 3-4 days in the fridge. It did lose the water but it was still crunchy and tasted the same as the first day. 🙂 I hope you enjoy it. This is one of my go to Korean side dish when I don’t have much time to cook anything. Crunch goodness! Yes, it’s such a simple dish to make. I always can’t get enough of it. 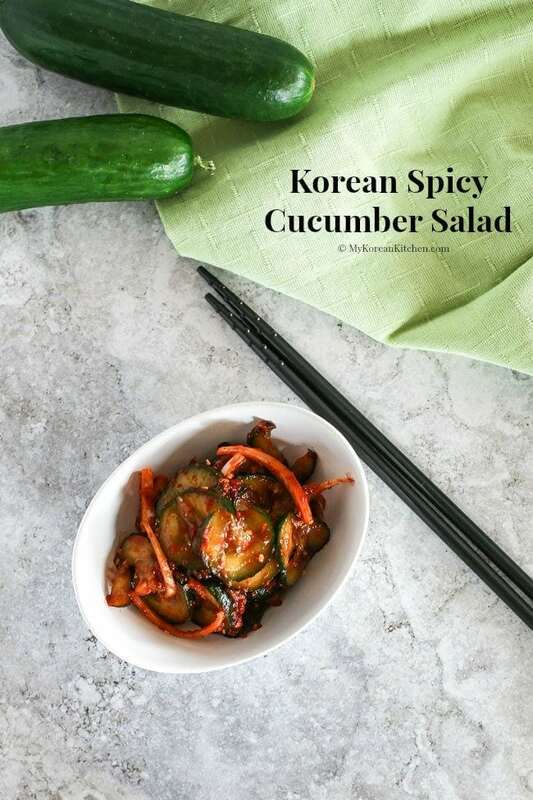 howdy – thanks for posting this recipe: I love cukes during hot weather & the bold seasoning will definitely help with appetites. I have a question: The instructions say to slice .5 mm, which is pretty much wafer-thin. But the photos show “regular” slices. Does this mean the size/texture is up to the cook? or, perhaps the instructions are in cm, not mm? Thanks Jenna! Yes, I meant to say 0.5cm. 🙂 I just fixed it. Thanks for pointing that out. I hope you enjoy it!